Guard Shack — Popular and Important Add-on a Business Should Consider | BIG Enterprises Inc. Regardless of your industry, keeping your business protected is a priority. In today’s uncertain times, you must take steps to be certain your facility is secure at all times. While installing a security system is one way to keep your building safe, it’s also vital to have trained staff at strategic locations on your property. Naturally, when positioning security staff on your property, it’s also important to take steps to be sure that staff can be in communication with one another and are protected from the elements. Installing a guard shack can help make that process easier. Depending on the nature of your facility, you might even find it beneficial to install more than one guard building. Given the latest advances in technology, it’s possible to ensure that all of your security buildings are connected—from a communications point of view--to make certain you always know what is going on. Guard shacks can be positioned anywhere on your property to greet visitors as they enter your grounds. A range of amenities is also available, including air conditioning. In fact, one of these facilities can function entirely on its own while staying completely connected to the rest of your operation. Guard booths can do far more than simply guard the entrance or exit to your facility. Since these booths are small and can be positioned practically anywhere on your property, they can also be used for a number of other functions. For instance, these booths can also be used as ticket kiosks for events. Do you need a kiosk where you can provide information to visitors? One of these booths is excellent for such purposes. Distributing everything from maps to information packets, these booths give you the ability to have staff positioned exactly where they need to be. The modular design of these booths also ensures they can be easily transported to another location, if the need should arise. The portable nature of these booths makes them a great investment. At B.I.G. 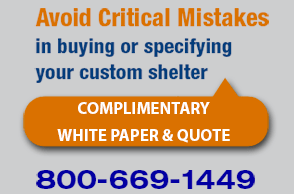 Enterprises, we take the greatest pride in delivering only the highest-quality guard booths. Built for complete functionality, these booths can also be customized to your specifications. The modular design even gives you the option to expand at some point in the future, if you would like. There are simply no limits to these products. You decide what you need and have the guard shack designed to meet your needs. For instance, you can have your booth built to whatever size you need and even include special features, such as interior countertops, windows, sliding windows, and electric load centers. Your guard booth will be ready to function in whatever manner you need. Security is one of the most important needs in any business, and it is a need you simply cannot afford to ignore. Investing in a guard shack can give your facility a greater level of flexibility while staying at the cutting edge of technology.